Likewise, talk about one salmagundi, a salmagundi, or the salmagundi. 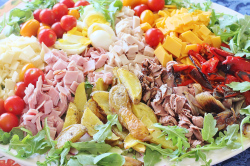 Salmagundi is a type of salad or big dish that has lots of kinds of meats, eggs, veggies, and so on. So, a salmagundi, abstractly, is any collection of stuff that includes lots of different kinds of things. Sometimes the spelling is "salmagundy" instead. Talk about a salmagundi of things to emphasize the variety (and perhaps color and interest) of those things: a salmagundi of accessories, a salmagundi of friends, a salmagundi of creative ideas. Because the salmagundi dish is often made of whatever leftovers you had lying around at the time, that sense of random slapdash may tinge the abstract usage, too: a salmagundi of job applicants who look like they stumbled in off the streets, a salmagundi of garage-sale wares that no one needed or wanted, and so on. If your meaning is clear, then you don't need that phrase "a salmagundi of..." and you can simply talk about a salmagundi, the salmagundi, a literary salmagundi, that musical salmagundi, etc. Our tiny local bookstore offers a salmagundi of novels, toys, posters, doodads, and of course, Hawaiiana. I sometimes pause to marvel at the salmagundi of features that Google offers; I guess you can accomplish almost anything with unlimited funding and an army of talented people. Look away from the screen to explain the definition in your own words. You’ll know you understand what "salmagundi” means when you can explain it without saying “hodgepodge" or “assortment." Think of a place or thing that impressed you by offering a great variety of something, and fill in the blanks: "I was so (impressed/excited/overwhelmed) by the salmagundi of _____ at (place or thing) that _____." Example: "I was so excited by the salmagundi of hair and makeup products at Sephora that I could have browsed in there for hours." Neil Gaiman: "Fairy tales are more than true; not because they tell us that dragons exist, but because they tell us that dragons can be beaten." A. the report ultimately lacked credibility. B. he was reluctant to use them since their authenticity was doubtful. C. the rich detail that they provided in combination really brought the project to life.